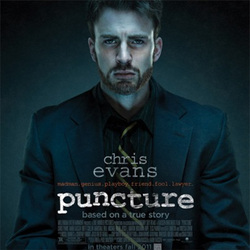 The courtroom drama meets the political thriller in Puncture, a film which tells the real life story of Michael Weiss (Played by Captain America himself, Chris Evans) a drug addicted lawyer who took on the health care establishment in order to implement an innovative, life saving needle. The case is one that would lead Weiss to battle the health care system and government’s addiction to money, as well as his own addictions. Puncture is a film with incredibly noble intentions, highlighting an interesting and important story that deserves everybody’s attention. In these days of the 99%, like Moneyball, Puncture portrays a real life example of somebody fighting against an unfair system. While Puncture may on the surface seem to have much more depth and complexity than Moneyball, it is telling that Moneyball is arguably the more profound film and explicable when you consider the scribes of Moneyball, compared to the scribe of Puncture. While Aaron Sorkin and Steven Zaillian (Two of the best writers in the business) were able to squeeze maximum thematic depth out of their source material, Chris Lopata cannot make Puncture as interesting as it sounds. While the central court case of the film is an inherently fascinating one, Lopata can never truly get to the depths of either the case or Michael Weiss. Puncture feels oddly stagy in the sense that we are told about the negative effects of these old needles but never really shown them. Ultimately the film never gives you the same rage that the characters had and it is likely that most rage felt during this film will be brought to, rather than supplied by the film itself. It is likely that the court case element of this film would have been better explored through a documentary, where we could get maximum analysis of the case as anybody looking for an in-depth, law based film will most likely leave disappointed. Especially given that the film abruptly ends just as it seems like the case is going somewhere. It’s as if the film is more focused on portraying what Weiss did while alive, rather than the impact that his actions had. This approach to the storytelling would be apt if the film was more of a character study, however we never really find out who Mike Weiss is. The roots of his drug addiction are never explored and we never really get much of a sense of a life beyond the constraints of the case. The portrayal of the wife of Mike Weiss in this film is also problematic and indicative of the portrayal of Mike Weiss himself. She has one scene in the film in which she asks for a divorce (Dramatically with the use of a gun) and is then never seen or significantly mentioned again. In the film there are multiple opportunities to properly explore the character of Mike Weiss but these moments are sadly fleeting. The film moves along at a brisk pace and is very gripping, however this is a film, which could have done with being longer and could have gone a bit deeper into the case and the characters that populate it. 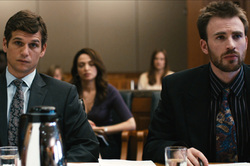 The film also briefly adheres to some of the courtroom drama clichés, with some rather formulaic movements. As referenced earlier, the stagy moments of the film pave way for some rather forced monologues, spoken by characters whose only purpose in the narrative seems to be a sound bite. The film could have been a lot more preachy than it was however and it ends on a much more personal and powerful note than it could have done, in the obligatory text based wrap up to films of this ilk. Despite Puncture’s flaws it is a film that is gripping to watch for its whole running time for three key reasons. Chris Evans gives one of his performances to date as Mike Weiss and is transformative from his role as Captain America this summer. This is not his Taxi Driver performance and perhaps suffers from the lack of meat for him to chew on in the script, however it is a performance that suggests incredible potential and guarantees that he is an actor to watch. The direction from Adam Kassen and Mark Kassen (Who gives a good performance as the professional partner of Mike Weiss) is surprisingly stylish and inventive considering the source material at hand. This is a film which could have easily lent itself to rather formal, anonymous filmmaking, however the Kassen brothers continually keep things interesting on a visual stand-point, with may camera angles and editing choices which suggest great potential and makes me want to check out their former and future work. A quick IMDB check has revealed that this is their first feature film and on the basis of this, I am sure we will be seeing them again. The film is one that deserves attention because the story behind the film needs highlighting. The Kassen brothers deserve more opportunities to experiment behind the camera and Chris Evans deserves the exposure for this to demonstrate that he can do more than dashing, heroic characters. The performances of Evans have been consistently great, with this joining his brilliant turn as Lucas Lee in Scott Pilgrim Vs. the World as my favourite performance of his so far. Overall the performance of Chris Evans and the direction of the Kassen Brothers elevates Puncture from its flawed screenplay, which never really gets under the skin of the story and characters at hand. It’s a gripping, important film, which ends on a genuinely surprising emotional moment and stands a chance of enlightening and inspiring those who watch it, yet sadly it never really excels the way it could and should. The story of Mike Weiss, the performance of Chris Evans and the direction of the Kassen brothers makes this film worth watching, however a slight screenplay from Chris Lopata suggests that the documentary format may had been a better cinematic home for this material. Disagree with this review? Give us your thoughts on Puncture in the Your Say section.